Roque de los Muchachos Observatory, La Palma. Mountain observatories seem to be very popular with the visitors to this site. At 2396 m, the elevation of the Roque de los Muchachos Observatory on La Palma doesn’t come close to that of the Sphinx Observatory (3571 m), but it’s not too far behind the Pic du Midi de Bigorre Observatory (2877 m) and it far surpasses Lick Observatory (1329 m). The Roque de los Muchachos Observatory comprises one half of the European Northern Observatory; the other half consists of the Teide Observatory on Tenerife (2390 m, if you’re curious). 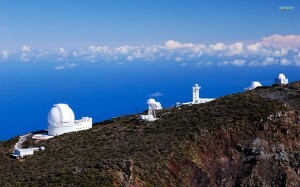 Both institutions are operated by the Instituto de Astrofísica de Canarias (IAC). The ENO represents more of Europe than you might guess (seriously, since when does the Canary Islands speak for an entire subcontinent?). Much of the instrumentation was provided by Denmark, Sweden, and the UK, and eight European countries signed up to be charter members of the International Scientific Committee (CCI) associated with the IAC. And by my count, the IAC has signed agreements of cooperation with seventeen other nations, including the United States. 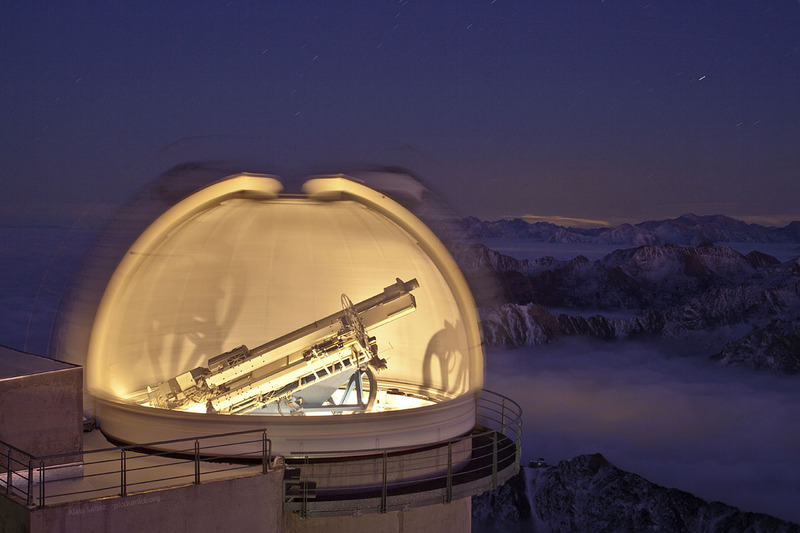 As at most major observatories in the world, observing time is determined through application, either directly to the Time Allocation Committee (CAT) or to the country that owns the instrument needed for the project. Click on the image for standard wallpaper sizes. So said Mrs. Mabel V. Socha, President of the Board of Park Commissioners, Los Angeles, California, in her Address at the Formal Opening of the Griffith Observatory and Planetarium, May 14, 1935. 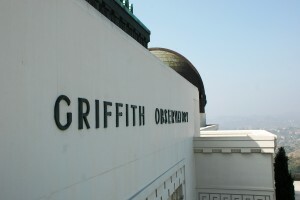 Perched on the south side of Mount Hollywood, overlooking the light-polluted flats of the Los Angeles basin, Griffith Observatory is poorly situated for observational astronomy. It’s perfectly situated, however, for its intended function: educating and entertaining the masses. Easily accessible by car and almost as easily accessible by footpath, the observatory is open to the public five days a week, free of charge. FREE OF CHARGE. Griffith is a model institution in terms of public outreach and astronomical education. Since its opening—courtesy of Colonel Griffith J. Griffith’s money and vision—the building has been anchored by a few key exhibits and instruments. Just inside the main entrance stands a Foucault Pendulum. Even as the building opened, however, its advocates must have realized that the pendulum would often take a back seat to its surroundings, as the ceilings and walls of the entrance rotunda are alive with color thanks to the murals of Hugo Ballin. As Mrs. Socha noted, “When you enter the foyer of the building your eyes behold the beautiful muraIs painted on the walls and ceiling by Mr. Hugo Ballin. The subjects chosen for his panels are very appropriate for this observatory and display the artistic ability of this famous artist. 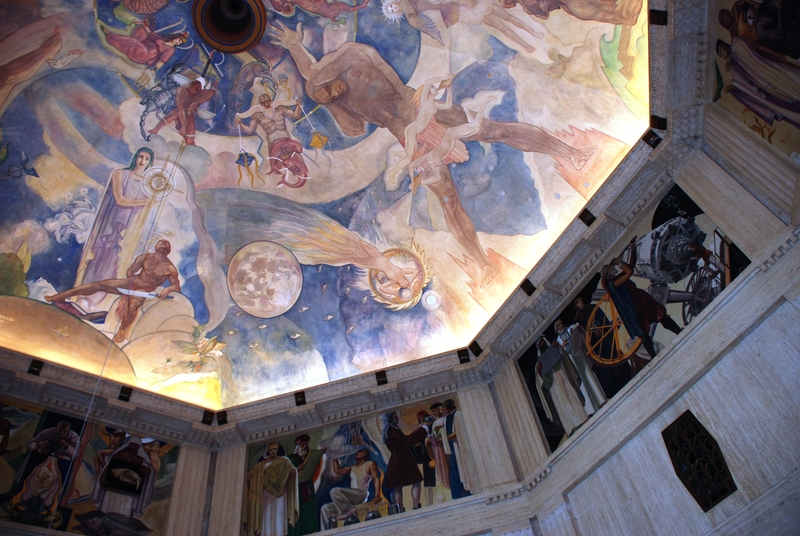 The coloring in the pictures and the perfect execution of the subject will excite your admiration and cause you to linger and absorb the beauty of these works of art.” The ceiling depicts Classical celestial mythology, while the wall panels celebrate the “Advancement of Science” with representations of astronomy, aeronautics, navigation, civil engineering, metallurgy and electricity, time, geology and biology, and mathematics and physics. 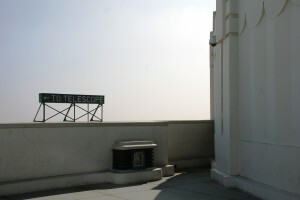 Also on the main floor, in the west rotunda of the Ahmanson Hall of the Sky, is a coelostat configured so its three mirrors feed separate solar telescopes. * When the sky is clear (it was mostly smoggy when I was there, the coelostat dome only opened after I started my hike below the observatory), visitors can study different aspects of the Sun through indirect observation. I super loved the Hall of the Eye, both for its exhibits on Observing in California and its Tesla Coil (who doesn’t love a good Tesla Coil?). There are more exhibits on the lower floor, including a 38-foot-diameter model of the moon and a fascinating section on meteorites in the California landscape. And of course, there’s the observatory’s central feature, the Samuel Oschin Planetarium. The best thing about Griffith Observatory has to be its public astronomy program, though. 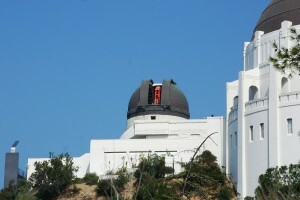 For daytime observing, there’s the coelostat. For nighttime observing, there’s the 12-inch Zeiss refracting telescope. That’s a good size for public viewing—even with LA’s light pollution, visitors can see the moon, planets and the brighter Messier objects. My own experience tells me that people who seldom look at the sky are completely blown away by the rings of Saturn and the moons of Jupiter, so you don’t need a huge telescope to give them a good show. The bigger the telescope the more time it takes to move around and refocus, anyway. The Zeiss was well worth $14,900 the Griffith Trust spent on it. The building itself owes a debt to the Beaux Arts; its floor plan and elevations are as symmetrical and formal as could possibly be. 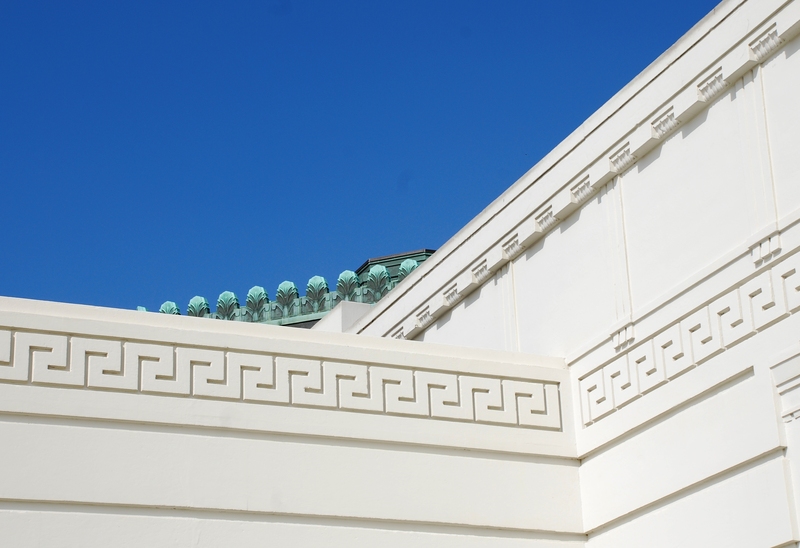 The original design called for more of a Mission flair, but the plans for terra cotta ornament were abandoned after the Long Beach earthquake in 1933. 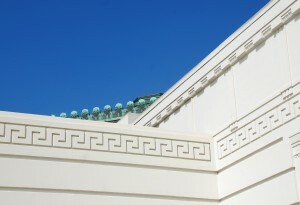 The observatory structure was shored up, its concrete walls thickened, and the ornamental program changed to something more in the spirit of the nearby Greek Theatre (also funded by Colonel Griffith J. Griffith). The building went under a major renovation in 2002 and is now a blinding white even on the smoggiest of days. I’ve uploaded a few more photos to my flickr site. 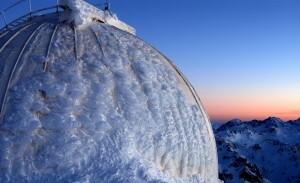 *The dome and instrument extend above the main floor, but the viewing points are in the Hall of the Sky. 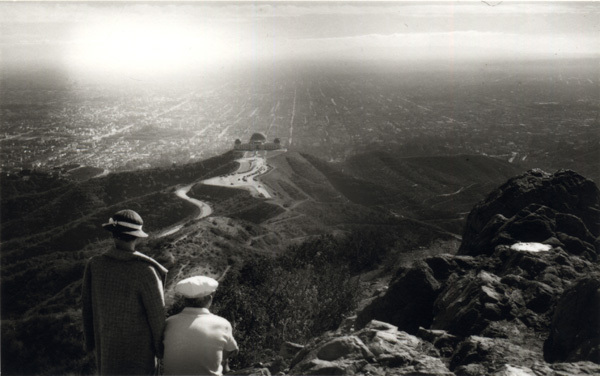 Julius Shulman, Looking Over Griffith Observatory and Los Angeles From Mount Hollywood, 1936. My students don’t know it, but they’re going to be watching Visual Acoustics: The Modernism of Julius Shulman while I’m out of town. It’s a fantastic film about Shulman’s architectural photography, with really clever transitions and sharp cinematography (I honestly don’t think the trailer does the documentary justice). I’m hoping that I’ll get to see some of Shulman’s photography at the In Focus: Los Angeles 1945-1980 exhibit at the Getty Center this weekend. 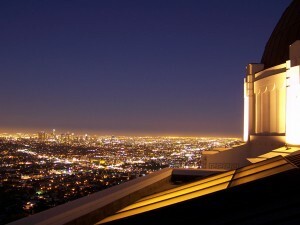 I love all of his work, but I especially love this photo of Griffith Observatory. It perfectly captures the essence of Modern space in Los Angeles—hills and horizon, light and linearity. By the time this post hits the Internet, I’ll be on my way to Los Angeles. 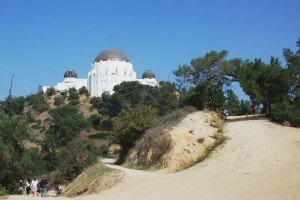 Although I was in LA relatively recently, I haven’t been up to Griffith Observatory since 1991 or 1992. I think it’s time for a return trip. Look for new photos some time next week. Click on the image to reach the wallpaper download page. I am completely snowed under right now. My students are discussing Lick Observatory this week in my Architecture & Science seminar, and I had great intentions of posting some images and other ephemera related to class. Not going to happen. Instead, I’m going to attempt to distract you with the photography of be*curious. It’s all superb, but I am particularly fond of his observatories and at night series. Okay, not a true wallpaper, but certainly one of my favorite APOD photos. Most people hit this site looking for information on Sphinx Observatory (look, I just generated 1000 more hits!) 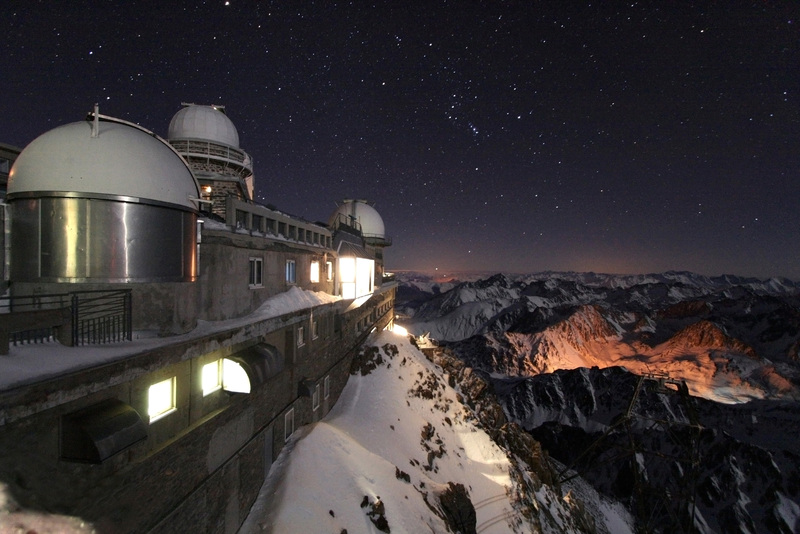 and I’ve always wondered: why isn’t the Pic du Midi de Bigorre Observatory as popular? It’s also a high-altitude observatory, located in a sufficiently dramatic mountain setting. Snow. Cold. Clear skies. Why does all the attention go to Sphinx? Just for good measure, I’m including a second Pic du Midi image from APOD. What’s not to love? How awesome is this online orrery? Embedded in the black background are small grey control switches. 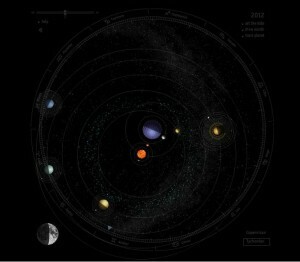 You can set the date, display the zodiac, or trace a particular planet on the upper right. The slide on the upper changes the direction and speed of the rotation. I’m particularly enamored with the Tychonian universe option on the lower right and the lunar phase option on the lower left. 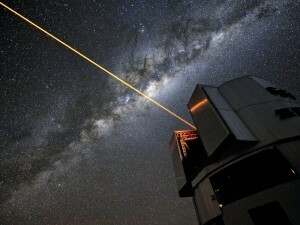 Because you can never have too many laser beams, I give you one of the Unit Telescopes of European Southern Observatory’s Very Large Telescope with laser beam fully operational. Click on the image to go to the download page.